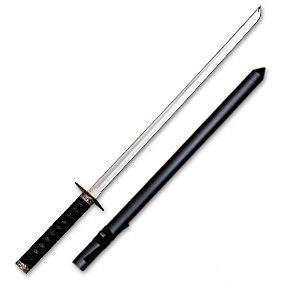 I am a complete ignorant and tried to look up more about the Ninjato, but couldn't understand if it existed as actual sword or if it's just an Hollywood production, due to different sources claiming one or the other. I mean, it looks cool as sword so it interested me. If it was real, is it built like that for a specific goal? "Because of the lack of any physical evidence or antique swords from the Sengoku period to the Edo period (16th to 19th century) matching the description of the ninjatō, the history of the weapon can only be reliably chronicled from the 20th century onwards." Tanto and moroha zukuri seem to be types of straight, one-edged Japanese blades that existed. Various sneaky people could have used them. Sneaky people do not order their sneaky weapons from specialized sneaky weapon suppliers who mark those blades as "Genuine, Conspicuous and Illegal, this NINJA-brand (c) (r) (tm) weapon is certain to give you the respect of your bandit buddies! Instant respect guaranteed, or cut me own throat!"